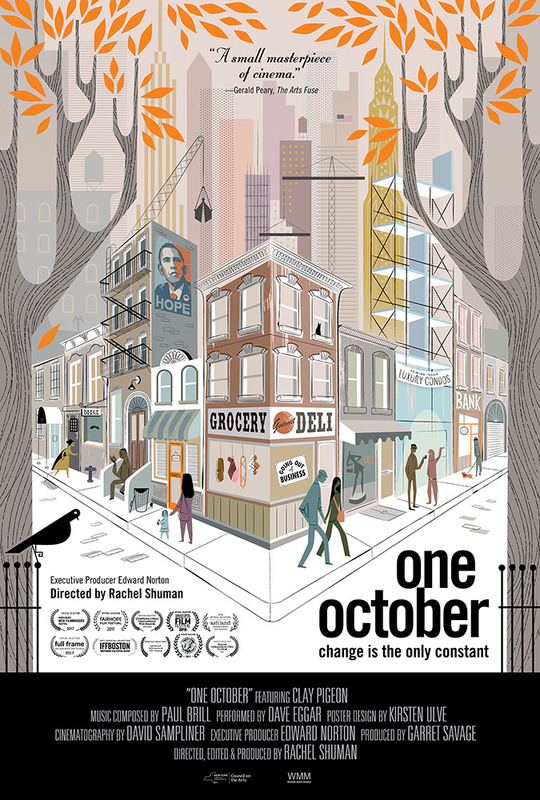 During his neighborhood rambles, Clay Pigeon meets people like Kristin, an optimistic young woman who has just arrived from the Midwest; Mark, a union construction worker still dusty from his workday and deeply in debt; Nicole, a transgender woman looking for an accepting community; and Stacie, a single mother in Harlem worried about gentrification. 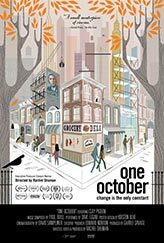 Nuanced, cinematic, and often humorous, ONE OCTOBER charts the chasm between one’s desires and one’s means, explores the urgent need to conserve the old amid the glorification of the new, and affirms the notion that a varied streetscape is essential to the health of a dynamic metropolis. Seen from our current vantage point, the film is also a remarkable time capsule that foreshadows the roiling political upheaval spreading across the country today. For 12 years Clay Pigeon hosted “The Dusty Show with Clay Pigeon,” a one-hour weekly program on WFMU, an independent freeform radio station in Jersey City, NJ. 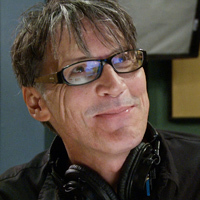 As of June 2017, Clay was promoted to host WFMU’s popular Morning Show, which airs M–F, 6–9AM on 91.1 in the New York tri-state area and online at wfmu.org. Clay was raised in Audubon, Iowa, where he first developed a conversational interview style that has informed his work over the years. After broadcasting school, he migrated to Clearwater, Florida, where he DJ’ed at WTAN and 96FEVER and played in the rock band Deloris Telescope. In 1998, Clay created a street interview–based program for WMNF in Tampa, which he continued to produce after moves to Los Angeles and Milwaukee. He relocated to New York in 2007, where he lives with his wife, illustrator Kirsten Ulve. 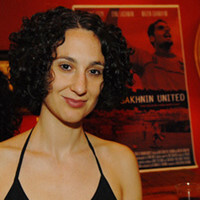 Rachel Shuman (Director, Editor, Producer) Rachel Shuman is a documentary filmmaker and editor who has worked in New York City for 20 years. Her directorial debut Negotiations premiered at the 2005 Tribeca Film Festival. She co-directed Art, Architecture, and Innovation: Celebrating the Guggenheim Museum, which aired on PBS and is now on view at the museum. Her editing credits include Five Seasons: The Gardens of Piet Oudolf (DOC NYC 2017), Wallace (Class 5 Films), Peter Eisenman (Checkerboard Films), and After the Cup (Variance Films). 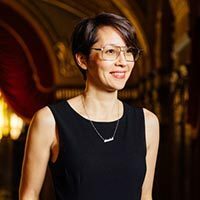 Rachel has also worked as an editor on nonfiction programming for A&E, History, and MTV and she is proud to be a board member of the Karen Schmeer Film Editing Fellowship. Originally from Boston, Rachel received a BFA from the California College of the Arts in San Francisco and an MFA from the School of Visual Arts in New York. 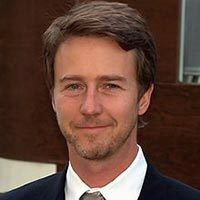 Edward Norton (Executive Producer) Edward Norton is a celebrated actor, director, writer, and producer who has starred in over 35 films. He has been nominated for three Academy Awards for his work in the films Primal Fear (1996), American History X (1998), and Birdman (2014). 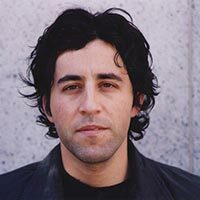 In addition to his work in feature films, he has produced award winning documentaries such as By the People: The Election of Barack Obama (HBO) and My Own Man (a Netflix Original). Garret Savage (Producer) Garret is a producer and editor based in Brooklyn. His documentary editing credits include the Peabody Award-winning My Perestroika, HBO’s How Democracy Works Now series, Ready, Set, Bag! (LA Film Festival), and IFC’s 4-Cylinder 400. He was an associate producer of the Emmy-nominated feature documentary Pressure Cooker (Participant Films). He has enjoyed working for Paramount Pictures, ABC/ESPN, Discovery, IFC, AMC, MTV, and more. 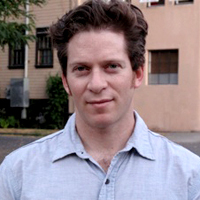 Garret was a 2009 Sundance Documentary Edit and Story Lab Fellow. He was the Program Director of the Nantucket Film Festival’s Teen View Film Lab and is a founder and Board President of the Karen Schmeer Film Editing Fellowship. Ursula Liang (Co-Producer) Ursula is a journalist who has told stories in a wide range of media. She has worked for The New York Times Op-Docs, T: The New York Times Style Magazine, ESPN The Magazine, Asia Pacific Forum on WBAI, StirTV, the 2050 Group, the Jax Show, Hyphen magazine and currently freelances as a film and television producer and story consultant. Her credits include: Tough Love (POV), Wo Ai Ni Mommy (POV), NBC Spartan Ultimate Team Challenge, UFC Primetime. Ursula’s directorial debut, 9-Man (America ReFramed) was called “an absorbing documentary” by The New York Times. She grew up in Newton, Mass. and lives in the Bronx, New York. David Sampliner (Cinematographer) David’s most recent documentary feature, My Own Man, premiered at the 2014 Tribeca Film Festival. His first documentary feature, Dirty Work (co-directed with Tim Nackashi), screened at the Sundance Film Festival, won Best Documentary Feature at the Atlanta Film Festival, and aired on the Sundance Channel. He co-directed Art, Architecture, and Innovation, a documentary about the history of the Guggenheim Museum broadcast on WNET Channel 13 and now on permanent exhibition at the Museum. 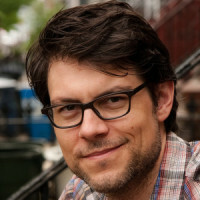 His recent short films include Bread Power for Etsy’s website, and the DVD featurette on the making of By the People: The Election of Barack Obama (Sony Pictures). Paul Brill (Composer) Paul Brill has received three Emmy Award nominations for his film scores and recently won the first-ever Best Music Award from the International Documentary Association. He collaborated with Rock legends U2 on the HBO film, Burma Soldier, composing a new string arrangement for an acoustic version of their classic song, “Walk On.” His recent work includes the hit documentaries, Joan Rivers: A Piece of Work (IFC), the Emmy Award-winning Page One: Inside the NY Times (Magnolia), the Sundance Festival winning films, Trapped, and Love Free or Die, and the Emmy, DuPont and Peabody Award-winning, 6-hour PBS documentary, The African Americans: Many Rivers to Cross. Contact us to request a screening for your group or venue. Jeremiah Moss interviews director Rachel Shuman. 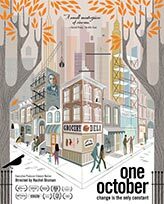 Interview with the team behind the new documentary One October, Clay Pigeon and director Rachel Shuman. This DVD comes with a public performance license intended for universities, libraries, and other institutions and is available through our educational distributor Passion River Films. It includes the 56-minute version of the film, as well as a bonus, behind the scenes interview with featured character Clay Pigeon. Download or stream the film in HD. Not for use in public screenings. It includes the 56-minute version of the film. This DVD includes the 56-minute version of the film, as well as a bonus, behind the scenes interview with featured character Clay Pigeon. Not for use in public screenings. Free shipping. Archival digital print (11 x 17”) of original film poster by Kirsten Ulve. Free shipping. Click poster to enlarge.